There are a number of ways to configure your workstations to use the Echo.Cloud.Filter DNS servers, the easiest being modifying your DHCP server settings. The Dynamic Host Configuration Protocol (DHCP) automates the assignment of IP addresses, DNS Servers, default routers, and other IP parameters. 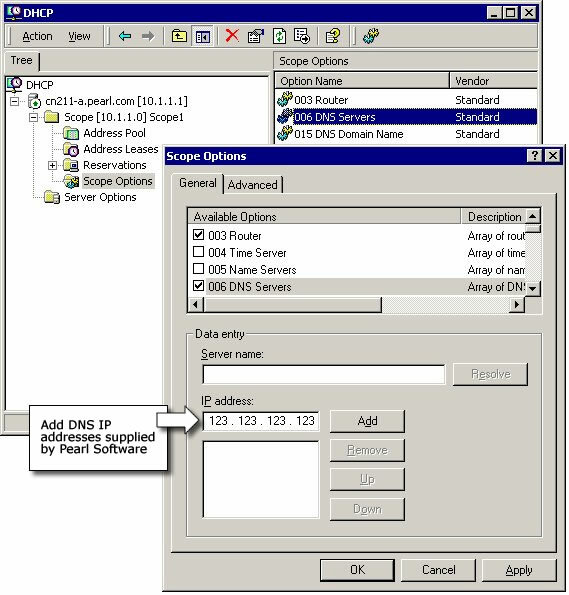 The assignment usually occurs when the DHCP configured computer boots or regains connectivity to the network. The DHCP client sends out a broadcast message requesting a response from a DHCP server on the local network. The query is typically initiated immediately after booting and before the client initiates any IP based communication with other hosts. The DHCP server then replies to the client with its assigned IP address, DNS server and default gateway information. When you order the Echo.Cloud.Filter, you will be emailed with the address of your custom managment portal as well as the IP address of Pearl Software's DNS servers. The following examples demonstrate how to modify DHCP in various environments. Note: If you would like to allow some users to have unfiltered Web access, you will want to create a separate DHCP Scope for those users.